Annapurna base camp visit is simply astonishing multi day tour visit in Nepal. Base camp hike is most requesting trail conceivable to investigate in seven days time for a trek in Annapurna gigantic. Travel to Annapurna base camp consolidate with the absolute most excellent mountain landscape, giving a captivating knowledge into the himalayan way of life. Immerse in the magnificence of the rich scene, green valley, and stroll along with the Rhododendron and oak trees to welcome the wonder of Annapurna massif. Mount Annapurna first, eighth tallest mountains on earth is a standout amongst the most brilliant tops on the planet. Express Annapurna Base Camp visit takes you through the intriguing customary Gurung people group and their towns who will welcome you with warm accommodation and hospitality. Trek to Annapurna base camp 7 to 10 days will be considering all the more intriguing in spring as the entire backwoods along the trail turns red, pink and white with rhododendron blossoms. Annapurna Base Camp trek short is called likewise an Annapurna express trek. An insane base camp trek course is same like Annapurna haven trek conceivable to investigate whenever all through the year. It is a classical trek with 8 days itinerary compared to most walks in this region leading up to the base camp. 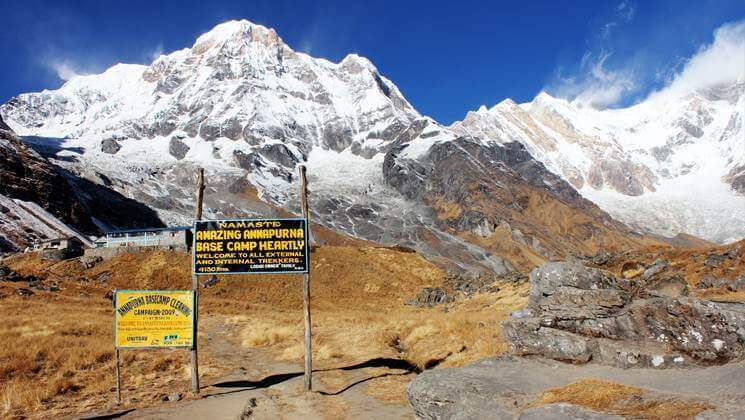 The particular route is design for world-explorer who wish to hike to the base camp in a more relaxed manner than take a look this itinerary Annapurna Base Camp Trek – 13 Days which would be a more appropriate choice. However For travelers who wish to reach the Annapurna base camp quickly but are walking with limited time wise than taking a look at this special itinerary. Annapurna base camp visit is simply astonishing multi day tour in Nepal. It is most requesting trail conceivable to investigate in seven days time for a trek in Annapurna gigantic. Travel to Annapurna base camp consolidate with the absolute most excellent mountain landscape, giving a captivating knowledge into the himalayan way of life. Immerse in the magnificence of the rich scene, green valley, and stroll along the otherworldly patios with Rhododendron and oak trees to welcome the wonder of Annapurna massif. Mount Annapurna first, eighth tallest mountains on earth is a standout amongst the most brilliant tops on the planet. Express Annapurna Base Camp visit takes you through the intriguing customary Gurung people group and their towns who will welcome you with warm accommodation. Trek to Annapurna base camp will be considerably all the more intriguing in spring as the entire backwoods along the trail turns red, pink and white with rhododendron blossoms. Annapurna Base Camp trek short is called likewise an Annapurna express trek. An insane base camp trek course is same like Annapurna haven trek conceivable to investigate whenever all through the year. Today, we start to go over Deurali viewpoint and then walk further to MBC. There are two different trails ahead of us; we follow the best way according to the season to Bagar and to MBC. These areas are the most possibility for avalanches and always be careful during the journey. You should have good information from your experienced guide who is organizing by Gokyo Treks & Expedition, before you start your journey to MBC. Take it seriously because there are already a lot of people who lost their lives here from viewpoint to Bagar. After Bagar, you are safe. The trail follows the left-hand tributary of the Modi River. You can see the sunrise with a natural Panoramic view above ABC hill station. From here we can see Annapurna 1st, Annapurna south, Barah Shikhar, Tent peak, Machapuchhare Hiunchuli and many more snow-capped mountains as well as glacier. Having breakfast in ABC, just descend down to Machapuchhare base camp. We can meet the crew and take all kinds of stuff descend down to Dovan passing several green valley and villages. Stay overnight at Dovan. The trek leads through intermittent bamboo and mixed forest. During the journey, you can pass through several villages, terraced and as well as flat land. You will have flat land from Syualibazar until Nayapool. After checkout from Annapurna Conservation office, we trek furthermore 30 minutes to reach Nayapul where our car is waiting. After that drive to Pokhara by car 1: 30 hrs then transfer to hotel on Fewa lakeside. Morning we’ll drive back through the scenic countryside and during the route will stop for breakfast & lunch. It takes 7 hours back to Kathmandu. On arrival at Kathmandu, you will have a coffee break at the office then proceed to drive to the International Airport onward your final destination flights and our trip end. Wish you your wonderful journey. How much does Annapurna base camp tour cost? Base camp annapurna tour 7 to 10 days is accessible now on USD 595 is standard trek cost on twofold inhabitance premise. Obviously, the outing cost will differ as indicated by gathering size. Taking flights to and from Pokhara spares your time and riding transport decreases the trek costs. For the special and extravagance trekking visit plan, we include Kathmandu – Pokhara – Kathmandu round outing airfare, 3-star class lodging fancy cooled room in Kathmandu (BB PLAN) and 2-star inn standard settlement in Pokhara (BB plan) with connected restroom while on trekking on conceivable spots. Also, WE ARE OPEN TO CUSTOMIZE YOUR TOUR AND PACKAGES PRICE AS PER YOUR REQUIREMENTS. Worldwide visit pioneers are exceedingly urged to get rebate and alluring complimentary. 1 night twin sharing on tourist standard accommodation in Kathmandu with breakfast plan. Tourist Bus transfer from Kathmandu – Nayapool for guest, nepali guide & porter. On return from Nayapool to Pokhara Fewa lake side transfer transfer by private vehicle. Tourist Bus transfer from Pokhara Fewa lake side to Kathmandu near Thamel for guest, nepali guide & porter. Insurances of guide and porters. We can organize private Annapurna base camp tour or abc tour or Annapurna base camp travel starting at any date that works for you. Please contact us for more information. Question: Is get benefit accessible if my entry day in Kathmandu? Answer: Yes beyond any doubt !! In the event that you give us your flights subtleties, you ought to do ask for then our agent will come to get you on Kathmandu worldwide airplane terminal. Question: Do I require the experience to do Annapurna base camp tour? Answer: It is reasonable for sharp trekkers/walkers who can stroll around 4 or 5 hours in multi day tour, with a lightweight daypack. For this trekking, in the event that you have about the little experience would be better. Question: What sort of settlement would i be able to expect on Annapurna base camp tour? Answer: We give you visitor standard convenience in Kathmandu and amid the trekking courses. the rooms along the courses are spotless with a comfortable bed with a decent sleeping pad and covers. Anyway we prescribe you to take your very own portable beds whether you have one with you else, you may lease it while you are in Kathmandu. Question: What sort of sustenance would i be able to expect in Annapurna base camp hotel tour? The supper and breakfast are given in a similar hotel you go through the night consistently and Lunch will be given while in transit to the following spot where you are going. Question: What openings will I have for a shower along express Annapurna base camp tour? Answer: Tea house trekking every one of the hotels they have a shower which you can get it some place paying and some place without paying in any case on the off chance that you are in outdoors trekking – we give you high temp water basin then you will take a can shower. Question: How would I get drinking water on express Annapurna Base Camp Trek? Answer: Most out of every other place on earth stays lodging and shops where you can ready to purchase mineral water and you can get it for drinking yet anyway we prompt against purchasing mineral water in plastic containers, as presently there are no arrangements for discarding these. Rather, we furnish you with bubbled water or bringing chlorine tablets to cleanse the typical water as the ordinary water is accessible in campground/along the way. Question: Can I charge my computerized camera or different batteries on my excursion? Answer: During the hotel trekking there will be more opportunities to charge the battery. We suggest you bring an additional combine for on the off chance that. Make sure to bring your connectors! An additional battery will be recommended. Is there any correspondence offices on Annapurna base camp tour? Answer: In this trekking course you can get telephone utilities just as web benefits as well. Question: Can I use charge cards in short Annapurna Base Camp Lodge Trek? Answer: No! In this way, for the trekking courses, you need money Nepali rupees since charge cards work just in the greater city areas. Question: When should I book my excursion and what is the installments terms? Answer: Because our excursions book up a very long time ahead of time, we prescribe booking right on time to evade any sort of misconception. We will, obviously, bend over backward to suit a minute ago appointments. What’s more, with respect to the store, we incline toward 20 % development store of the all-out cost of the trek so as to affirm your reservation before you touch base in Nepal. What’s more, whatever is left of the installment can be made after your entry in Nepal. Question: Who will convey my gear on Annapurna base camp visit? Answer: We give watchmen to exchange your gear. As we are a capable trekking visit administrator organization, every one of our doormen conveys limit of 25 kilo of your knapsack which implies 2 visitors (12.5 kg baggage of every visitor): 1 watchman premise. Question: How much separation do I walk every day? Answer: When strolling in the mountains, the separation you cover every day can fluctuate enormously because of the angle, landscape, and elevation. In that capacity it is extremely difficult to give explicit separations on every day, in any case, you must be set up to walk generally around 5 hours each day. Question: Do I require trek pools ? Answer: Walking pools are prescribed yet not mandatory. Question: Is there any possibility to hire a trek guide? how to rent a local trek guide? Answer: Yes! Obviously. Annapurna asylum trekking is likewise Annapurna base camp express trekking so don’t confuse. Question: How much extra cash do I require per day? Answer: You can designate US$ 08 – 10 for a lunch/supper in Kathmandu and it relies upon your ways of managing money. US$ 7 to 10 US$ every day will be sufficient to purchase containers of water, chocolates, tea espresso and a few beverages while you are on trek. Explore Annapurna Himalayas within 360 deg angle standing in Annapurna base camp view point. Walking through the cultivated fields and watch the splendid views of Annapurna mountain ranges. Get an experience about various communities like Gurung and other ethnic groups and their local lives. As the data expressed above is only a guide and standard layout what we give you, be that as it may, the excursion can be modified at your demand to oblige your particular prerequisites. Neighborhood legislative issues, avalanches, dropping of nearby flights, climate, transport or a huge number of different components that are outside our ability to control can result in a difference in agenda amid on excursion. It is, notwithstanding, truly unimaginable that the schedule would be broadly changed. On the off chance that adjustments are essential the pioneer will choose the best elective alternative, mulling over the best advantages of the entire gathering. Where a change occurs, we do all that we can to limit its impact, yet we can’t be in charge of the consequences of changes or delays. Finally…. we did our trekking to ABC. It has long journey for us, and its really worthy…. to see spectacular view all the way and especially our way from MBC (Machhapuchhere base camp) to ABC (Annapurna base camp) .